Juicy Stakes and Intertops Poker have just started a great Blackjack bonus offer that will pay you up to $1000 if you're lucky enough to be dealt one of three special Blackjack hands. Natural Blackjacks win a $40 prize. 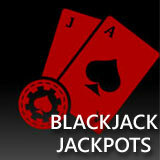 Lucky 7s – a Blackjack with three sevens – wins $100 extra. A “Big Suite” is Ace-2-3-4-5-6 (in any order) and that pays $1000. You can win your Blackjack Jackpot playing any of the four Blackjack variations available in the casino section of the poker rooms: Blackjack, Face Up 21, Double Draw or Perfect Pair. (Games in Intertops’ main casino are not included). Blackjack Jackpots are available until October 31st, 2015 only. Juicy Stakes and Intertops Poker are the two busiest poker rooms on the Revolution Poker Network. Their poker tables attract players at all skill levels, from all over the world. This month they’re hosting an online satellite tournament series that will send the champion to compete in the WPT National in Venice in December. Next month, winners of other online satellite tournaments will play in the $500K CPT Punta Cana. Tournament winners share their online and live tournament experiences in the Living the Dream poker blog.